Skye Hardaway from The Work of Heart Photography is having a huge giveaway. Skye is a Professional photographer who specializes in child photography. 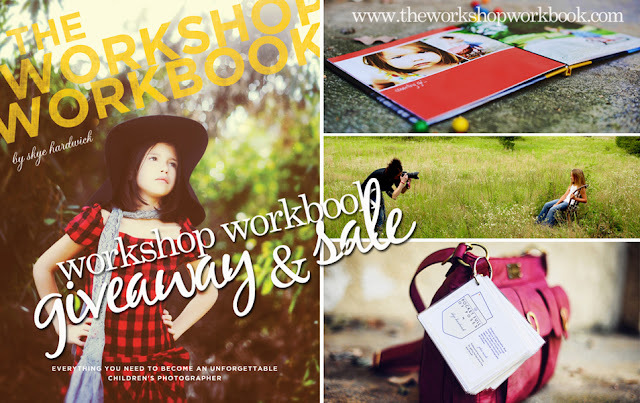 She shares all her photography tips and secrets through workshops and her workshop workbook. Now I actually purchased the 'Workshop Workbook' about 8 months ago (on sale of course) Love the posing guide. As a wannabe photographer i love that she lets you in on what she carries in her oh-so-funky camera bag and most of the photos let on her blog and facebook page tell you what lens and actions she used. I think to myself "Now wait on a minute, I have that lens so why can't i do that" so then i go off with my camera in hand and practice for what i know is an attainable shot. The workbook is great too. Sky shows you her methods for post processing her pics. There are also forms and docs to use if you are getting into professional photography. She covers everything you would need to know as a pro photographer. A guide like this would seriously save your life, well, it will save you a heap of time at the very least. So go and check out the workbook for yourself (it's on sale) or try to win a freebie like I am by entering into the Work of Heart giveaway. Yes, yes, I know I already have the workbook but I really want a chance to pick up all the other freebies on offer as well as the update version of the posing guide. I'm reading: Work of Heart Photography GiveawayTweet this! It's a pity I didn't hear such a nice photographer when I was a kid. Or I might have many speacial and beautiful photos now.